TV Licensing's annual report found 89% of children's viewing time is still devoted to live TV programming. Although they are surrounded by hi-tech ways of seeing their favourite programmes, the majority of Scottish children still watch them on television sets. 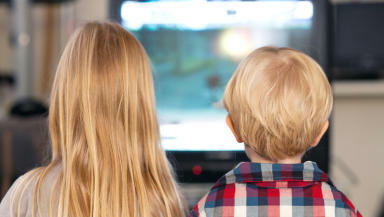 A survey suggested youngsters rush home from school to sit in front of a TV, rather than watch online. 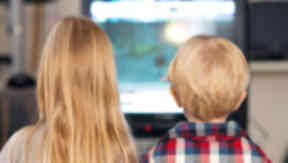 TV Licensing's annual Telescope Report looks at the country's changing television habits and this year they focused on children's television viewing. They found 89% of children's viewing time is still devoted to live TV programming, and they spend an average of two hours 23 minutes a day watching TV. The figure is an hour and a half less than the national average of three hours 55 minutes. Despite three quarters of UK homes having the ability to record programmes and watch them later, today's children still like to hurry home for fear of missing their favourite show. Pipa Doubtfire, Head of Revenue Management, BBC TV Licensing, said: "Children's TV - as well as wider family entertainment programming - continues to play a central role in households. The families we spoke to during our research for TeleScope 2014 had a wide variety of viewing habits, but all found TV programmes had the ability to bring the family together. "It was also fascinating to see despite children having more devices and more ways in which to consume their favourite shows, the traditional TV set and live viewing are still the overwhelmingly the most favoured methods. "With so many ways to watch TV, it's important to remember a TV Licence is needed to watch programmes online via your computer, laptop or tablet as they're being shown on TV."